BJ’s first words after eating a slice: “I think this may be the best pizza we have ever made.” It was pretty dang good. I figured I would have to re-open since my haitus with something really good and it doesn’t get any better than the best pizza we have ever made. Here’s one reason – we cooked the dough for a while before we put the ingredients on. We usually don’t do this because the toppings require cooking too. 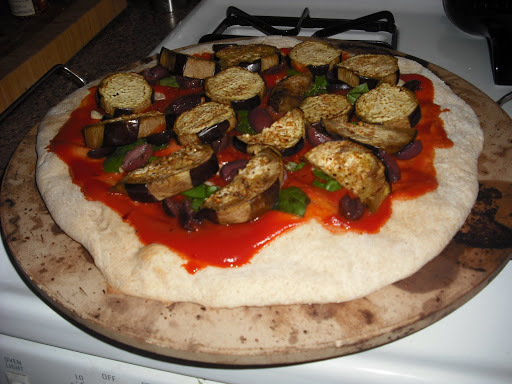 But since I roasted the eggplant first, I thought I would give the dough a head start too. Good thought because it turned out with incredible flavor and excellent crispy crust. But the layering continued…Kalmata olives. And cheese. Lots of cheese. Good cheese too. Thick slices of Provolone…mmmmmm. 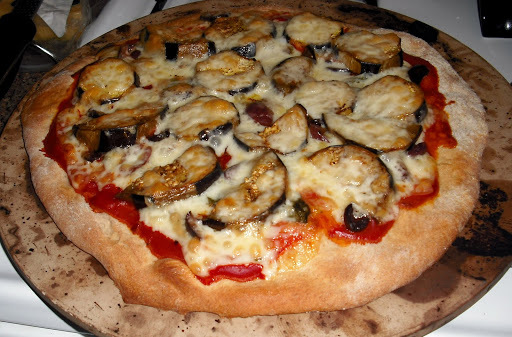 Slice eggplant into 1/4 – 1/2 inch slices. Drizzle slices in EVOO and season with S & P. Place on a cookie sheet and roast at 400 degrees for 15 – 20 minutes, until lightly browned. Halve the large slices. Set aside. Turn oven up to 500 and place pizza stone in oven to warm up. Turn oven back down to 425 after 5 – 10 minutes. Roll dough out to desired shape. Place on pizza stone and drizzle with EVOO. 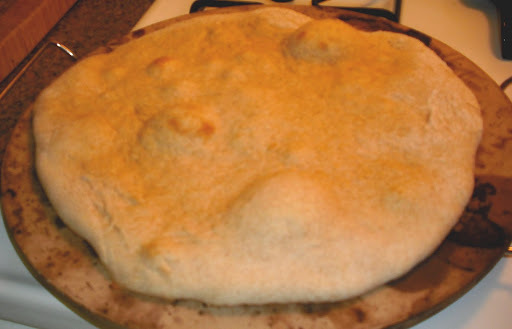 Cook dough 8 – 10 minutes until top just begins to brown and bubble. Remove from oven. 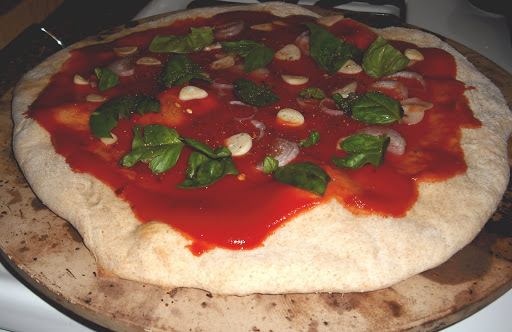 Spread tomato sauce over pizza. Season with S & P and crushed red pepper. Arrange slices of shallot and garlic over sauce. Add basil leaves and then scatter olives. 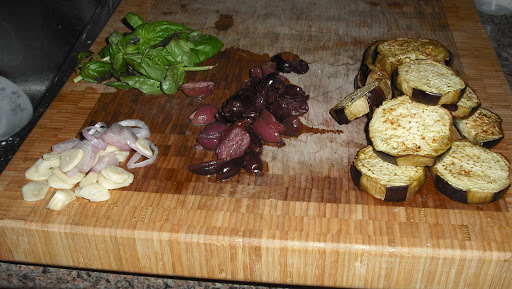 Arrange eggplant slices. 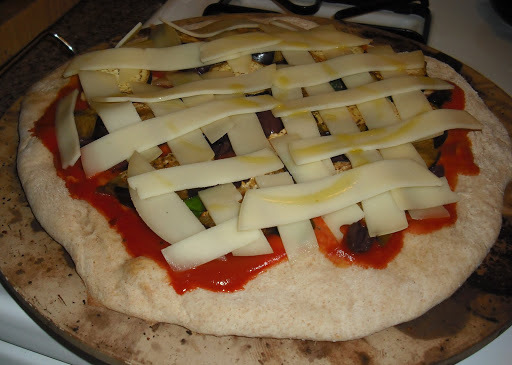 Lastly, arrange cheese slices on top. Drizzle with EVOO , if desired. Bake pizza for 20 – 25 minutes until cheese id browned on top and bubble. Let rest for 5 minutes and then dig in! 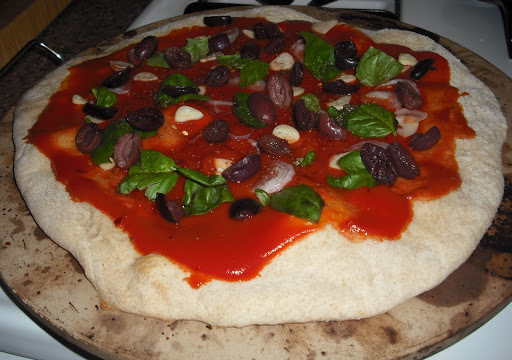 This entry was posted in pizza, Vegetarian by callywoodfarms. Bookmark the permalink.